The words “second-hand” have been a part of my vocabulary for as long as I can remember. I grew up with hand-me-downs and things my mom bought at the local Mennonite Central Committee (MCC) Thrift Shop. When I began earning my own money, it was just natural that I would shop there as well. I still have the very first item I bought with my own money over 25 years ago: an over-sized, man’s sweater. You can read more about that in my first blog. 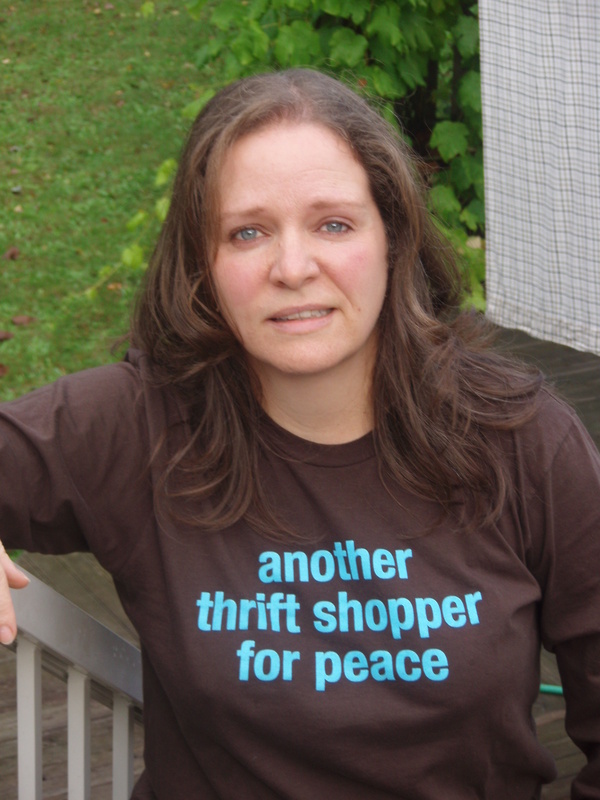 Why “Thrift Shopper for Peace”? For me, thrift is more than a shopping option, it is a lifestyle. It is active peacemaking. Thrift shopping supports the environment, volunteerism in the community, charity at home and abroad. It creates a level shopping ground for people of all income levels. When I donate and purchase at a thrift shop I’m keeping things out of a land-fill – making peace with the environment. When I volunteer, I am part of a community of people that I might not interact with otherwise – making peace in my community. When I support a charity (by donating, purchasing and volunteering) I am helping to build peace at home and around the world. Supporting a shop that enables people of all income levels to own things of value is, to me, a peace value as well. And it doesn’t hurt that you save a ton of money when you shop thrift. Thanks for your comment on my blog entry! I’m glad to find your blog as well! Looking forward to reading about your scores. I totally agree with your philosophy about thrifting. Happy to have found your blog! I was googling thrift shops in Oliver, and came across your blog. Kind of cool to find out that you also live in Abbotsford:) I was just in the MCC Abby East shop yesterday, spent a whole 50 cents on a bread knife. We have bought a tiny vacation/try it out for retirement…. house in Oliver. I visited the hospital thrift store there a couple of weeks ago, bought a bread box. Will have to make a trip to Osoyoos the next time we go. There is also at least one thrift store in Okanagan Falls, 15 min. north of Oliver. Hubby bought some jeans there:) Even if I buy something at a thrift store, and then decide I didn’t really need it, I don’t mind. Know the money is going to a good cause, and just donate it back again so that it can be sold again. we just discovered the okanagan falls shop last year – after years and years of going to the tickleberries icecream place – but it was closed. hopefully this year we’ll get a chance to check that out. oliver is a lovely little community. my sister would love to retire there as well! what hours are you guys open till? hi dave, i’ve been on holidays for the last couple of weeks and will get back to you on the make of the wallet when i get back tomorrow. thanks! okay, so i’m home and i’ve checked the wallet and oddly enough, it has no brand marking on it anywhere! it makes me think that it must have been purchased at a place like Bentley or perhaps a department store. sorry i couldn’t be more helpful! I was so excited to find your blog! Thank you so much for linking me in your sidebar. Your blog is amazing! I have been reading through it all morning. Happy thrifting! thanks for the kudos! love your blog too. Nice blog here! Have you been living in Bangladesh lately? Just wondering. thanks! and no, i live in Canada but i have been thinking about Bangladesh ever since the garment factory collapsed there. it raised my awareness about the injustices in the garment industry. I’m a recent transplant to BC who was googling local thrift stores and came across your blog. What a great find! We live in Richmond, and I adore the thrift stores in Steveston, particularly the hospital thrift store. I have to ask – have you been to the Delta Hospital Auxiliary Thrift Store in Ladner? This is by far the best thrift store I’ve found in terms of selection/price combined. It’s in a little strip mall in Ladner next to an amazing bakery, and they have enough items so that they have three disparate stores – housewares/toys/small items, clothing and furniture/large items/outdoor equipment. Some of my best finds there have included a small lamp ($2), a wall painting ($3 or 4, I think?) and a Hoover wet/dry dustbuster ($3), but I seriously never leave empty-handed. The volunteers are lovely – they must have around 20+ volunteers there at any one time – and they are constantly putting new items on the shelves. Oh, and they do test all electronics before putting them on the shelves. I love shopping without having to worry about whether my purchase will actually work once I get it home. I have never been to this one and i LOVE hearing about other thrift shops – especially when they come with such a great endorsement! I will definitely make a point of checking this out. I thrifted at the hospital auxiliary thrift shop in Steveston a year ago and blogged about it here https://thriftshopperforpeace.wordpress.com/2012/09/21/thrifting-in-steveston/ i love it too – such a great building! Nice to find your blog. Really good deals you got at those thrift shops. Wish can find more great deals like that at thrift shops in Malaysia. Especially now I am experimenting on Living with Minimum Wage in Malaysia , definitely need to find more bargains. I love your blog…..thank you for all your research and dedication. thanks so much – it’s really a labour of love! hey angelika! I see you’ve already got one, but just wanted to let you know i nominated you for a liebster award 🙂 you can click https://joelwatchesmovies.wordpress.com/2015/12/04/liebster-award-nomination/ to see my post for it if you want! aww, thanks Joel! Since I have already been nominated, I’ll forgot the process but I”m so honoured that you thought of me. thanks again!